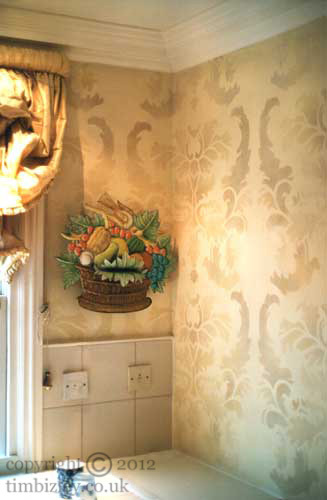 This stencil work with glazes and mural embellishments ran throughout a large flat in London. Massive and prolonged water damage resulted in about a half of the work having to be re-done from scratch, with some smaller areas being renovated. Specialist decorators are often asked to undertake the restoration existing work, so loved and enjoyed do bespoke decorative schemes become. The work was undertaken for a private client in the U.K.